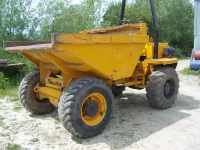 We are breaking this THWAITES 6 Tonne unit All parts availble. Problem with reverse on transmission. Axles, rams etc good. Engine reasonable. All panels available.